Ebola fight: Three boys stand in the “red zone” where they are being treated for Ebola on October 28 at the Bong County Ebola Treatment Unit, east of the capital, Monrovia. During his weekly general audience on October 29, Pope Francis urged prayers and international action to fight the Ebola virus. POPE Francis pleaded for the international community to take stronger, co-ordinated steps to “annihilate” the Ebola virus and help the millions of people impacted by the disease. “As the Ebola virus epidemic worsens, I want to express my deep concern for this relentless illness that is spreading particularly on the African continent and especially among populations that are already disadvantaged,” the Pope said on October 29 at the end of his weekly general audience. Pope Francis offered his prayers and solidarity with the sick, as well as with the doctors, nurses, volunteers, religious orders and humanitarian agencies working “heroically to help our sick brothers and sisters”. “I ask you to pray for them and for all who have lost their lives,” the Pope said. The day before the Pope’s appeal, Caritas Internationalis – the umbrella organisation for Catholic charities around the world – announced it would hold a special meeting in Rome on November 4 to co-ordinate ways to increase the work Catholic charities were doing in response to the epidemic, especially in West Africa. 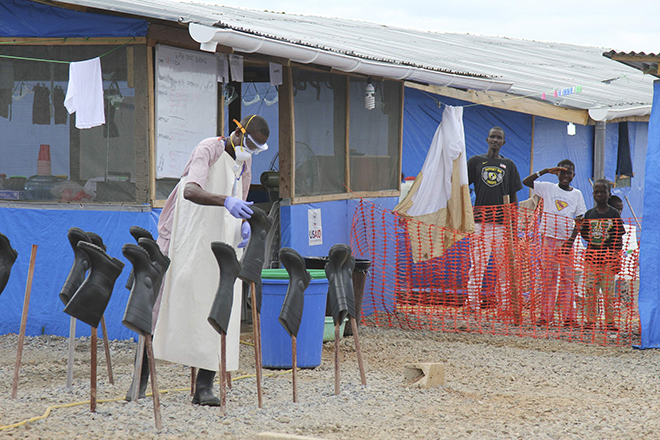 “At this point, it’s not only about preventing Ebola. We’re also called to care for the thousands of healthy people who were already poor, who have no access to health care for other illnesses and whose lives have been turned upside down by this crisis,” the Caritas health advisor Monsignor Robert Vitillo said. “This is a shattering emergency. We need to strengthen the response of Caritas and our collaboration with other Catholic Church organisations as quickly as possible. Our brothers and sisters cannot wait,” Msgr Vitillo said. The priest also said the organisations would discuss ways to “respond to the global reactions of panic and of stigmatising that are directed at West Africans, migrants from the region, and even at returning health care volunteers”. The World Health Organisation reported on October 25 that “10,141 confirmed, probable and suspected cases of Ebola virus disease have been reported” in Guinea, Liberia, Mali, Sierra Leone, Spain and the United States, as well as previously in Nigeria and Senegal, where the disease reportedly has been contained. As of October 23, the report said, 4922 of those infected had died.